A few weeks ago I was cleaning out a corner where I had stamping supplies and found some old editions of CardMaker Magazine. CardMaker has been really good to me and has published a lot of my designs over the years, but I only wanted to keep some selected copies, so as I perused through them I ended up finding a really fun layout and colour combination from a card created in 2011. That card used printed die-cut images and patterned paper to design a card very much like what I was inspired to create today. I wanted to see if I could re-create it with stamping and colouring, so it was a fun challenge to pull together. I pulled out Power Poppy’s beauty of a set, Potted Primroses because it’s so perfect for the spring season on it’s way! I’ve already seen little pots of primroses in the grocery store. I love them because they come in such a variety of colours. Today’s colours reminded me of tomatoes somehow! Done in the no-line style to go with our Power and Spark Challenge this month, coloured up with Copics. I stamped elements from the set on all the background layers and added a little scalloped eyelet punched border, some twine, faux stitching with my piercer and a white sharpie, and used the white sharpie to highlight the sentiment too. Oh Christine, this is simply delightful! I love the design, the way you colored up these sweet little primrose "faces" and the color combo you chose! I always love being inspired by other things that catch my eye -- especially if it turns out having a flair all your own! Those primroses look so sweet and pretty, and I absolutely love your card design and the tomato red. This definitely makes for a cheery "hello"! 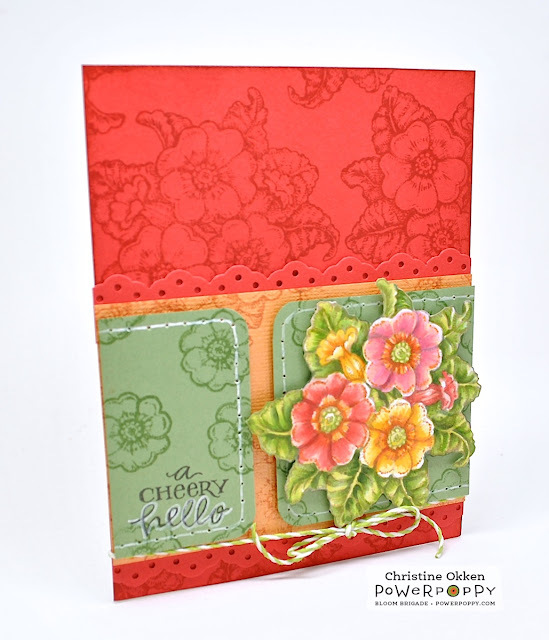 Love the fun sketch, the colors are so pretty, and like how you stamped the background, pretty coloring of the flowers, the faux stitching is a great touch! I didn't know sharpie had a white pen, may have to check that out, my white gel pens have all dried up.